Perfect ﻿﻿Privacy is a Switzerland-based VPN with a laundry list of advanced privacy features. Founded back in 2008, they’ve secured their spot amongst the most robust, high-end Virtual Private Networks on the market right now. Heavily geared toward privacy protection, the fittingly named Perfect Privacy offers the best encryption protocols the industry has to offer, backed by unique functionality, cross-platform support, and servers in 23 countries. Considering its reputation of excellence, I was still curious if it stands up to its “perfect” name. Prices are not my favorite part of Perfect Privacy. Even though you can use a disposable email to subscribe, as well as pay using PayPal, Bitcoin, credit card and more than 60 other options via Paymentwall, their pricing structure is anything but flexible. Set at $15.77 per month for a monthly subscription, $14 per month for a three-month plan, $12.85 per month for a 6-month subscription, $12.17 per month for a 12-month plan, and $10.46 per month for two-year plan, it’s definitely one of the most expensive VPNs out there. But the true disappointment kicked in when I realized there was no free trial. Nada. Zilch. It’s buy-it or leave-it. They do have a seven-day refund policy with some limitations, but to have an in-depth hands-on experience with it before you commit to a long-term subscription, you’ll have to buy a monthly plan first. There’s a reason PP is so expensive, though: they offer quite an impressive set of goodies. You can run its software on an unlimited number of devices as long as you’re the only person using your account. They support Windows, Linux, Mac, Android and iOS, and while some apps are easier to set up and configure than others, installation and setup is fairly straightforward. For example, you can download an Android APK directly from your member’s area. But if you want to use OpenVPN protocol from a mobile device, you’ll have to install the OpenVPN Connect app from Google Play and download config files from the Perfect Privacy website. Even though it’s a bit of a hassle, you only need to do it once. The Windows client isn’t a beauty, but it’s functional and intuitive. Settings are conveniently tabbed, and you’ll have no trouble accessing the load of technical extras like cascading, stealth VPN, Proxy, port forwarding, and a kill switch. Tweaking the basic stuff like DNS leak protection, firewall, and program behavior on startup is equally simple. You can firewall your local router with just one click, enable IPv6 leaks, or set the DNS server manually. I loved how every single feature has a question mark next to it. When you hover over it, you get a concise explanation of what it does in layman terms. Excellent. 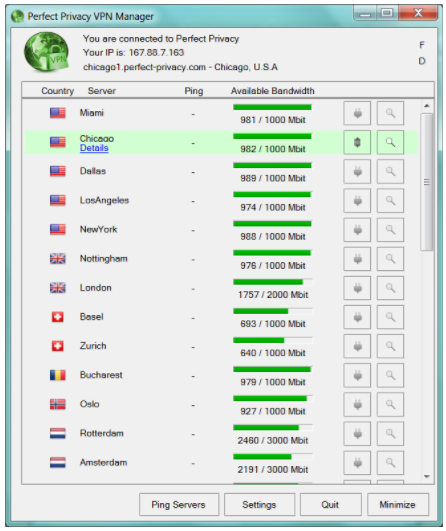 You can sort servers by country, ping, available bandwidth or name, while connecting and disconnecting is easy from the tray icon. Perfect Privacy has no annoying bandwidth caps, nor traffic limits, which makes it a no-brainer choice for families. VPN cascading is a Mr. Robot-kind-of-tweak that sends your traffic through a chain of four VPN connections. So, if a spy agency were ever to try and track you down, they’d have to hop from one location to another as you evade the detection the Bond-style, or Bean-style. Your member’s area has some nifty toggles, too. It lets you enable the tracking protection, anti-phishing, blocking of ads, known malware-infested websites, Facebook tracking – you get the idea. Perfect Privacy runs circa 40 servers in 25 countries, and Europe is the most heavily-covered region. Their coverage of other areas is fairly decent too, however. On the flip side, it did leak IPv6, but I was able to find a thread on Perfect Privacy forums that made it clear a third-party firewall could be causing the issue. If you’re not particularly tech-savvy, you may want to try something with a not-so-steep learning curve. 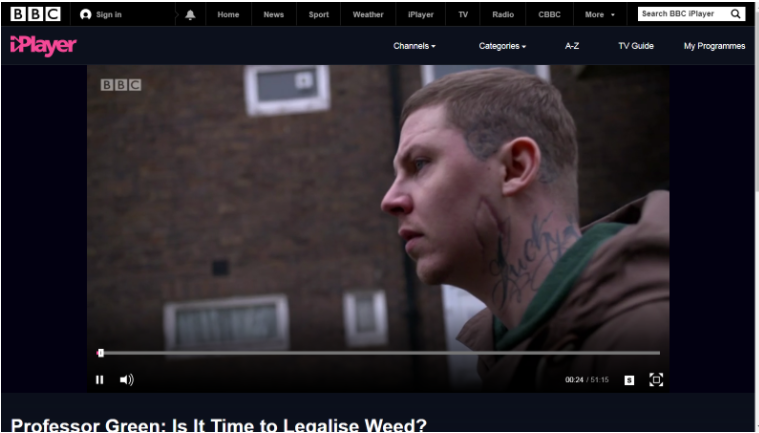 PP allows P2P torrenting and streaming, and while it unblocked BBC iPlayer with ease on desktop and mobile, things didn’t work out with Netflix for me. Security-wise, Perfect Privacy lets you connect via OpenVPN or IPSec, both of which use AES-256, and use a plethora of security extras. If you’re having speed issues, you might try lower-grade encryption. SSG2 tunnels are available, too. Perfect Privacy is robust, feature-rich and makes for an excellent choice if you’re tech-savvy and looking to max out your privacy at all times. Otherwise, you might end up with loads of features you don’t need and no Netflix – at a fairly high price.